ACI Technologies is tasked with decapsulation of electronics components for testing and investigative purposes. In the normal method of decapsulation, an analyst will drill a small indentation, with a rotary tool, in the hermetic sealant material and then apply Nitric acid to eat through the polymeric encapsulant. ACI performs this decapsulation for a number of purposes, including wire bond inspection, operational testing, and counterfeit investigation. 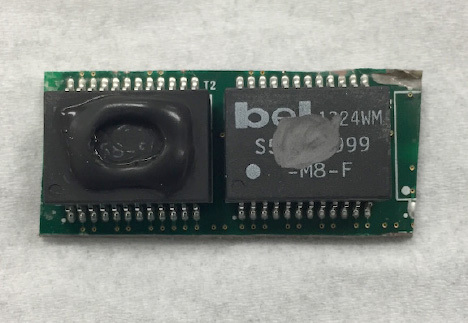 This testing method allows the operator to explore a silicon die while it’s still on a functioning board. Typical pieces being tested are 5x5mm in size. In the traditional method of decapsulation, the operator makes a small well above the location of the die and places the component in a tin tray on top of a 140 deg. C hot plate. Nitric acid is then added in a dropwise fashion into the well for digestion of the packaging material. After 10-30 seconds, the acid is rinsed with acetone for neutralization. The process is repeated until the die and wire bonds of the package are exposed. It is difficult to direct where the acid is working on the encapsulant. To form the well, Heston built up about 2-4 grams of Pelseal caulk above the die location (in place of carving out a small well) and placed the component on the hot plate. Once the component reached the correct temperature, he was able to drop nitric acid into the fabricated well and allow digestion of the packaging material. This was then rinsed with acetone and repeated until the die was exposed. By avoiding drilling directly into the surface of the die, no additional mechanical damage was introduced. ESD/EOS “electrostatic discharge/electrical overstress” was removed from the equation thus increasing the confidence in results. The Pelseal caulk was easily removed after decapsulation by simply tugging on it with a pair of tweezers (Pelseal caulk stood up to repeated acetone rinse steps). The deposition of Pelseal allows outlining of various geometries, making it possible to utilize Pelseal with a wide range of die sizes and shapes. Safety is increased by creating a well on the surface of the die that stands above the original topography, eliminating any splashing or accidental misuse of concentrated acids. A larger quantity of acid could be used in the Pelseal well, resulting in less time needed for the decapsulation process. After determining the use of a Pelseal caulk “well” makes the decapsulation process easier and more effective, ACI will continue to utilize Pelseal caulk and plans to integrate it into their standard decapsulation procedures. Two identical (side by side) components with Pelseal well on left and carved well on the right.